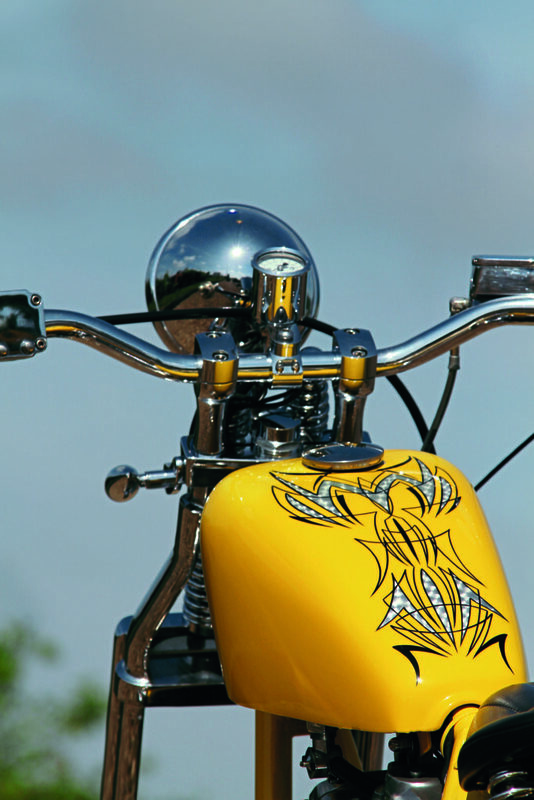 The importation of custom (and classic) motorcycles into Great Britain from the former colonies is neither anything new nor unusual, although it has perhaps become a little less high profile than it was a couple of decades ago or so. Just because we’re not seeing the chrome-encrusted billet barges that were being brought to Blighty at around the turn of the century doesn’t mean that the trade of American-built custom bikes has finished. Nor is it likely to, even though the current trends stateside aren’t especially appropriate for European tastes (more of which, later on in this article). Albeit imported recently, the bike you see here was built in America back in 2005, by Jerry Covington of Covington Customs. 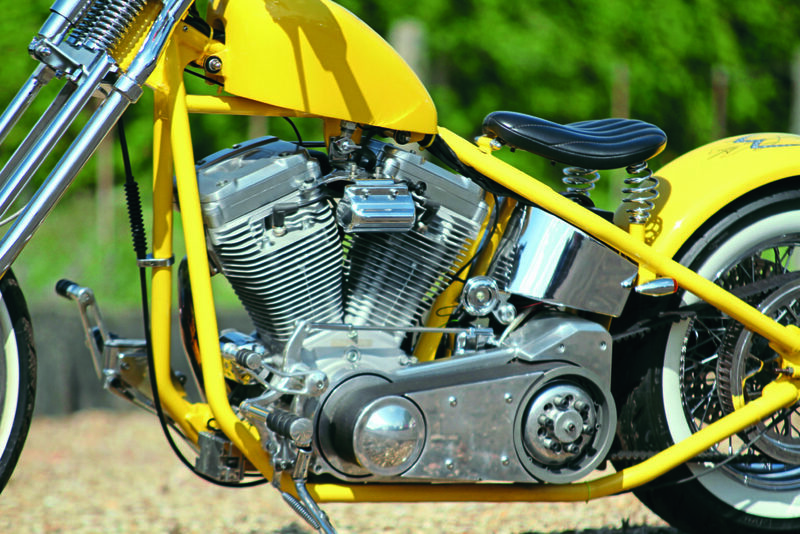 For those of you who’ve neither seen the Discovery Channel’s The Great Biker Build-Off series or don’t follow the American custom bike scene, Jerry Covington is a long-standing bike builder of some note. Having founded Covington Cycle City back in the Seventies, he swiftly became one of the world’s premier bike builders alongside the likes of Arlen Ness, Mondo Porras, Dave Perewitz etc., and, much like many of those other high profile builders, not only featured in magazines such as Easyriders, Hot Bike and Street Chopper, but also in custom motorcycle-related books including Art of The Chopper and Top Chops which, somewhat strangely, were far easier to source in the UK than in the States. And yes, I have got both books… anorak? Me? Like many of the American custom bike builders these days, the Covington workshop now seems to focus primarily on baggers – the touring-inspired, hard luggage-equipped big wheelers that’re only in favour Stateside and seemingly yet to be accepted by the rest of the world – although their range was initially focused on more traditional custom styles, like this one. 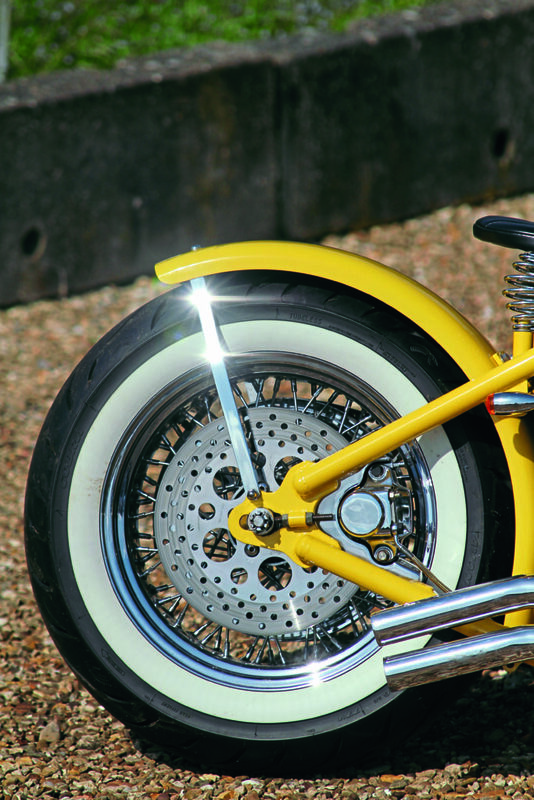 Using an internally standard 1340cc Evolution engine, the build centres around a hardtail Kraftech frame of classic proportions, with traditionally sized chopper wheels (which is, of course, a 21-inch rim at the front, and a 16-inch at the rear), and a set of chromed springer forks, made by Paughco and featuring that neat single damper unit beneath the single headlight. While the 81.8 cubic inch engine is as it came from the Milwaukee factory, the transmission isn’t H-D, but is a five-speed unit from Baker Drivetrain in Haslett, Michigan, with an open belt primary drive joining the two. So, essentially, this bike is a simple build – clean, unassuming, and eminently usable. 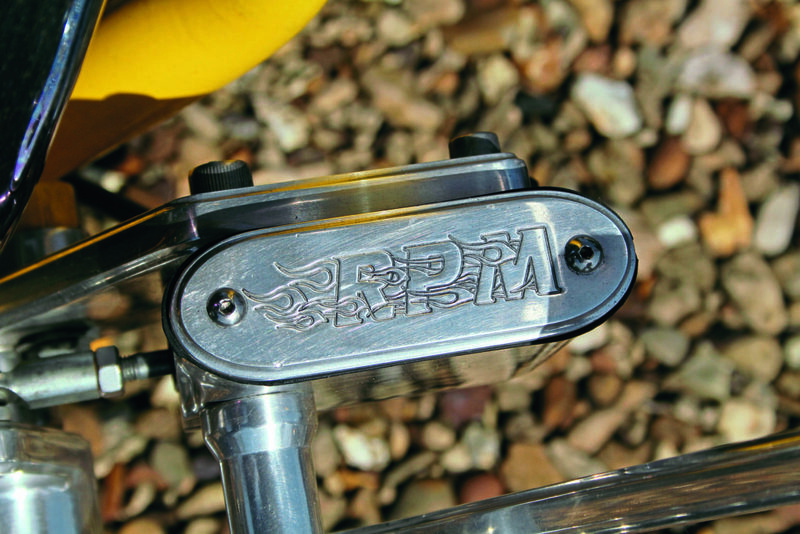 What shines through, though, is the countless years of experience that’ve been racked up by Jerry and the Covington crew in building custom bikes, as there’s so little in the way of clutter or clumsiness. The choice of parts is exemplary, and everything just fits so well together – just look at the way the rear caliper sits between the rear frame rails, with the profile of the body neatly matched not only by the caliper hanger bracket, but also the shape of the gusset between the frame rails that forms the spindle plate. Naturally, apart from the off-the-shelf aftermarket parts such as the switchgear, mirror, forward controls etc., everything else was undertaken in the Covington workshop, with all the fabrication of the exhaust pipes, brackets, spacers, caliper hangers, oil tank and Sportster fuel tank mounts done there. I suppose, when you’ve been building bikes for yourself and customers for as long as Jerry and his crew have, you’d expect nothing else. 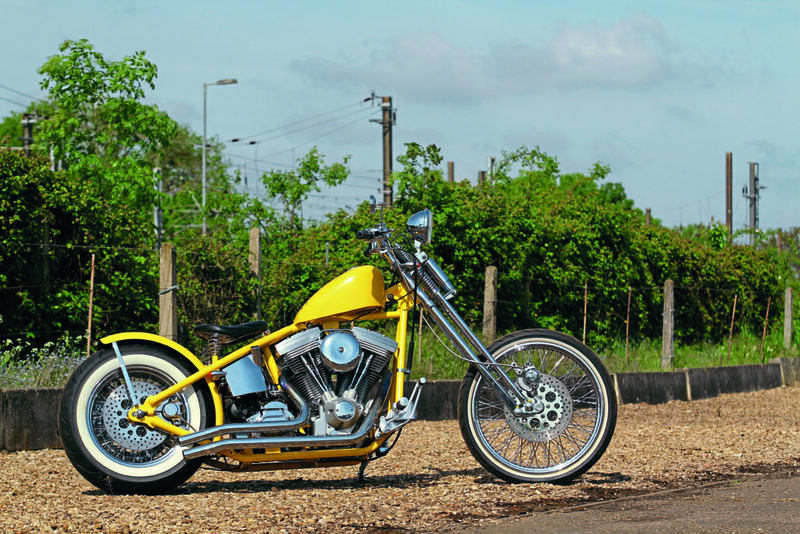 This extends a little further than fabrication of parts and their subsequent assembly, such as the one-off wiring loom that’s so neatly tucked away, and the eye-searingly bright yellow paint and the detailing on the top of both the petrol tank and the rear mudguard, consisting of neat, machine-turned panels in the steel, covered by lacquer and outlined and emphasised by some neat, gloss black pin-striping.